Choose a location and date that suits you and meet other like minded couples in a small friendly group! Our practitioners will help prepare you for the birth, using Natal Hypnotherapy techniques. 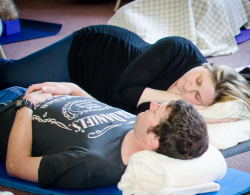 Our antenatal classes take you through the journey in small groups, or with individual couples, to learn deep relaxation and positive visualisation in a calm and relaxed setting. We work to understand and help you meet your needs. Our licenced practitioners were trained in our Royal College of Midwives accredited practitioner training programme. They are supported with Continual Professional Development and their performance is assessed on an ongoing basis.